Tank Details: All-Glass, 24"x12"x16", 20 US Gal. The Fish: 2 False Percula Clowns, 1 Three Stripe Damsel, 1 Purple Pseudochromis, 2 Sandsifting Starfish, 1 Cleaner Shrimp, 1 Fire Red Shrimp, 16 Blue Leg Hermit Crabs & 6 Mexican Turbo Snails. Comments: 16 lbs. 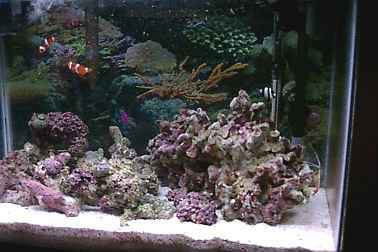 Martial Islands live rock, deep live sand bed, 9,325 K 55W compact fluorescent strip light, 20 W actinic strip light, Prizm Skimmer, Hagen AquaClear 201 Powerhead & Fluval 204 Cannister Filter.